Tourists from all over the globe go on Egypt Pyramid tour packages, escorted Egypt Pyramid holidays package are the you great entry to view and admire the greatest achievements of the Pharaohs. The three Pyramids of Giza Cheops - Khafre - Menkaure, together with the famous sphinx, were all constructed in the period between 2550 and 2480 BC as the royal necropolis of these famous kings and the sphinx was erected to protect the complex. The Pyramids of Giza embody one of the most important steps of the evolution of the burial architecture of the ancient Egyptians. In the very beginning the body of the deceased was only buried in a hole in the ground. Afterwards, a small structure, or a Mastaba, was built on top of this hole. The first attempt to construct a pyramid was carried out by Djoser, who belonged to the 3rd dynasty, when his architect; Amenhotep, erected the famous step pyramid in Saqqara. The first proper pyramid was actually achieved by senfru, the father of Cheops, in Dahshur. Famous as the Red Pyramid, it was constructed after a number of failure attempts carried out by the same king near Fayoum and in other structures in Dahshur. This is why there are some Egypt pyramid tour packages that specialize in Egypt Pyramids in particular in order to enable the guests of Egypt to understand the various steps that the pyramid construction process has passed through. 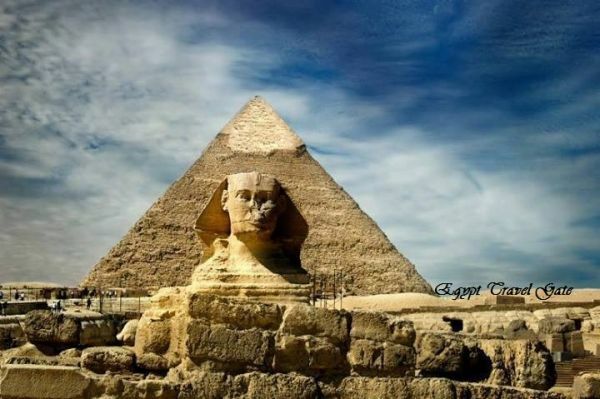 Many travelers book private Cairo Pyramids tour in Egypt to view the greatness of the Grand Pyramid, or the Pyramid of Cheops, as the construction method of this structure is still a mystery despite the many theories concerning the way the pyramid was built. Regarded as one of the old Seven Wonders of the World, the Pyramid of Cheops is now 137 meters height and the length of each side of its base is 230 meters. The stones used to construct the pyramid weigh from one ton to twenty five tons. The construction process of the Pyramid of Giza took around 20 years to finish the building of one of the most astonishing structures on earth and the most important monument in Egypt. Although many kings of ancient Egypt tried to construct pyramids during their ruling period to reflect their greatness, the Pyramids of Giza will always remain as the masterpiece of the architecture and arts of ancient Egypt.